The iTunes Store makes it possible to upgrade several of my songs to the new iTunes Plus version, but if I have the same music library on two different Macs, what is the easiest way to upgrade both? Also, more of my songs will be available in the future, so this process will have to be repeated more than once. Ideally you’d have an application that keeps an eye on what you’ve done in one iTunes library and then automatically makes changes in the other. And that ideal is realized in Sonzea’s $25 Syncopation. 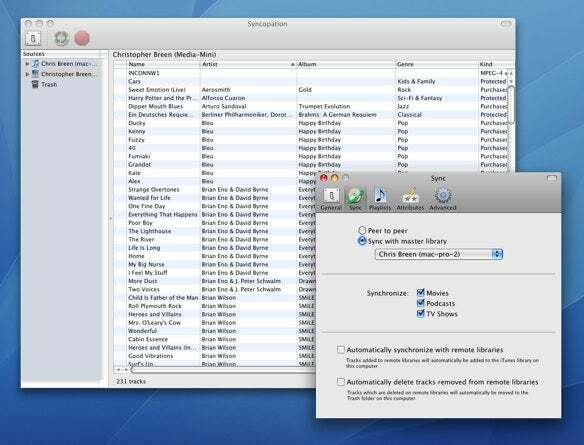 As the name hints, Syncopation tracks what’s in the iTunes libraries of the Macs on a local network it’s installed on and when you make a change to one library, Syncopation copies the new files to the other Macs’ libraries. This includes not only music files, but also videos and podcasts. You can choose to synchronize everything in the library or just selected playlists. It won’t synchronize smart playlists but it will synchronize ratings, play counts, and last play dates. You can choose to synchronize in both directions—so regardless of which Mac you add content to, the others are updated as well—or designate one Mac to be the source that others synchronize from. You can also direct it to synchronize library contents without actually copying the files. This is useful when you’ve created a central iTunes media server and want only the track names from the server listed in the various iTunes libraries. You can also configure Syncopation so that files deleted from one Mac’s iTunes library are deleted from others. Syncopation lives up to its name. There’s one hitch for your specific situation. When you upgrade an existing track or album to iTunes Plus, Syncopation doesn’t see it as different content so it will not update the synchronized clients. This then requires that you delete the tracks from the clients and then synchronize. When you do, the iTunes Plus tracks will be synced to your other Macs. Other than that, it’s easy and it works. To see for yourself, try the 30-day full-featured free trial, which supports two Macs.